Bed and Breakfasts near Heart Of Midlothian Tynecastle Stadium for 1 night from Sat Apr 20, 2019 to Sun Apr 21, 2019 within 25 miles, in an Average Nightly price range of £1 to £200. LUXURY AA FIVE STAR GUEST HOUSE AND APARTMENTS IN EDINBURGH CITY<br> <br> Immaculate and stylish guest accommodation just 15 minutes walk to Princes Street.Free secure parking and free internet access with wi-fi, included in the tariff. We offer comprehensive accommodation listings and online booking of Edinburgh Hotels,Edinburgh B&B, Guesthouses in Edinburgh and Edinburgh Apartments Cheap Edinburgh Hotels and accommodation in Edinburgh 'Auld Reekie' and accommodation in Scotland. Braveheart Guest House offers high quality city centre Bed and Breakfast accommodation to visitors eager to stay in the heart of Edinburgh Scotland's historic capital city. Bravehear Guest House Located 10mins walk to princes street & 15 mins to Castle. The closest guesthouse to the Castle! Set in a historic listed building, we are the ideal location for your visit to Scotland's Capital. Add five star hospitality, the finest of Scottish cooked breakfasts, & a free car park - and your base is established! Central Edinburgh B&B accommodation in an elegant B listed, period property convenient for all main attractions. This family business provides comfort, quality and a friendly atmosphere. The continental breakfast is highly recommended by our guests. A 7-minute walk from Edinburgh Castle, Syozant Lauriston Central ApartHotel is located in Edinburgh and provides rooms with free WiFi. Popular points of interest nearby include EICC and University of Edinburgh. All rooms in the property are fitted with a wardrobe. The property features a shared lounge and kitchen. Royal Mile is a 9-minute walk from Syozant Lauriston Central, while Edinburgh Military Tattoo is a 10-minute walk away. The nearest airport is Edinburgh Airport, 10 km from the accommodation. easyHotel Princes Street is located in Edinburgh's main shopping area and within walking distance to Edinburgh's Waverley Train Station and the main Bus Station. Also there's a 24/7 shuttle service which runs between Edinburgh's Airport and city centre. easyHotel.com Edinburgh is located in the heart of Edinburgh city centre in the New Town facing Edinburgh Castle. You have easy access to transport links from Waverley Train Station and regular links to the airport. Great place for visiting the sites. 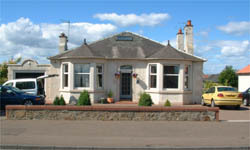 Dalmore Lodge is a 5 bedroomed guest house handily situated between Edinburgh Airport and the city centre. All rooms en-suite. We are ideally placed for those wishing to explore Edinburgh. Within walking distance of Murrayfield Rugby Stadium. A Quiet Retreat at the Heart of Edinburghs Old Town, a few footsteps away from the Royal Mile and 5 minute walk from the Train Station, where the Airport Bus also stops. August only. Located in Edinburgh s historic Old Town the newly refurbished 3 star KM Central offers a modern and sophisticated designed accommodation only a short walk from Princes Street Waverley Rail station and Edinburgh s Royal Mile. All 45 double rooms have en-suite shower rooms. They benefit from all the essentials such as Freeview TV Tea/coffee making facilities Free Wi-Fi internet access hairdryers in room safe and are inclusive of cooked breakfast. Guests will also benefit from the 24-hour reception. KM Central is within easy walking distance of Princes of all main tourist attractions including Edinburgh Castle and the National Museum of Scotland. This location is ideal for business trips Festival visits and city breaks. Full Scottish breakfasts are served daily. Light continental options fresh fruit and vegetarian breakfasts are also available. Please note that there is no lift in the building. Centrally located, Royal Mile and Castle only a 20 minute walk away. Bus stop on doorstep.<br> Car park, comfy beds, great breakfasts, free wi-fi. Handy for all attractions,university departments, new Infirmary. Local shops, pubs and restaurants. Ben Craig House is situated in central Edinburgh. We offer secured car parking free of charge. The Glenisla is housed in a 19th Century Georgian building, retaining its traditional appearance with some wonderful original cornices, elegant high ceilings and stained glass windows with attractive gardens to the front and rear. Welcome to the Northumberland Hotel in Edinburgh a traditional child-friendly individually styled hotel which is an ideal base for golf breaks shopping and tourist attractions. The hotel has an experienced and dedicated team who through their personal service aim to ensure that guests have a comfortable and relaxing stay. The Northumberland Hotel is a25 bedroom hotel situated just 1.8 miles from Edinburgh city centre. The hotel is ideally located for business travellers golf breaks families and sightseeing. The city centre is just 5 minutes away by bus or taxi. For the business traveller to Edinburgh we have available free wireless broadband and photocopy and fax facilities. Different from most hotels in Edinburgh the Northumberland Hotel also has a free secure guest car park.